In Second Life every year, during the American Cancer Society's "Relay for Life" season, there are a number of fundraisers supporting this effort. This year, Mike Stackpole will be doing a reading challenge in Second Life in support of the ACS, reading his newest book At The Queen’s Command live on select Friday dates, for as long as people are in Second Life and continuing to donate. More details about this can be found at stormwolf.com. Interview: Nathan Lowell answered the call for authors who've embraced the non-traditional paths for publishing their work. 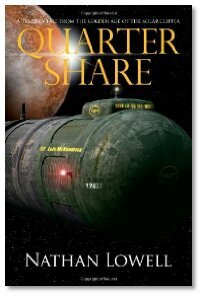 He was inspired by Dragon Page several years ago and wrote his story geared towards release on Podiobooks, starting with Quarter Share, and continuing with Half Share, Full Share, Double Share, Captain's Share, and will conclude with Owner's Share. Nathan talks about the path to gaining an audience while expanding the story of following an average guy looking for work, how it eventually garnered a print run to satisfy his existing fans who wanted a print version of the story they'd loved, and engaging his readers while also promoting the work.